We book the driving test for you as part of your Intensive Driving Course but if you prefer to book your test for yourself you can do so online. Go to our links page, by phone or by post . Appointments can be changed and cancelled online or via phone with 3 working days notice. Help with your bookingContact the Driver and Vehicle Standards Agency (DVSA) to get help booking your theory test, or book if you don’t have an email address. To book a practical test by post you will need an application form which you can download here . 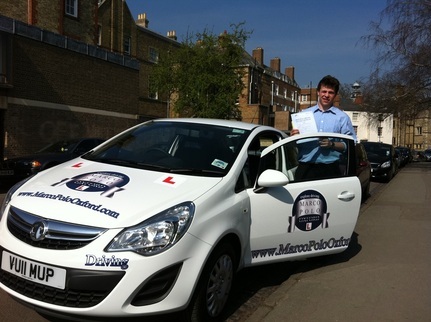 "I believe that Marco Polo Oxford is an excellent driving school as Marco taught me with a calming, pleasant, patient and encouraging attitude that helped me to improve my driving skills dramatically each lesson - making me pass First Time in one week!!! There is no doubt that I recommend Marco is an excellent teacher, who is capable of teaching anyone, no matter what level he or she is at"